It has been a year already (at times it seems like more), but Droog is exactly what I expected when I made the decision to embark on the challenge of owning such an animal. 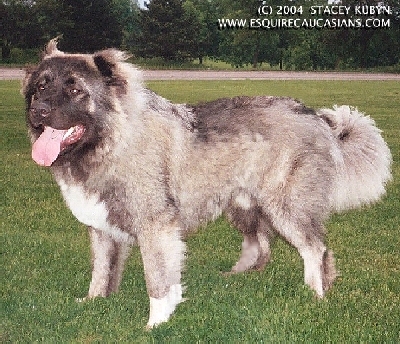 He is a magnificent representative of the Caucasian Ovcharka breed. He has awesome awareness, intuition, athleticism and power. He never second guesses himself ; if he's wrong he knows it, and deals with the consequences of his actions when that time comes. He never argues his point. He has attitude! Droog will not often allow a person that does not [know] him to get away with not acknowledging that he is there. He wants them to know that they are [in] his presence, and that they are only there because he is allowing them to be. On the other hand he loves the attention that he gets from people. We love Droog, and are happy to be able to share him with everyone who dares to get close enough to experience being in the presence of such an impressive dog.